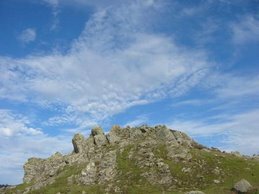 I know I shouldn't complain about the weather in LA because it's always so nice and sunny, but what's up with the weather lately? It has been scorchingly hot and I have had a hankering for something decidedly cool. 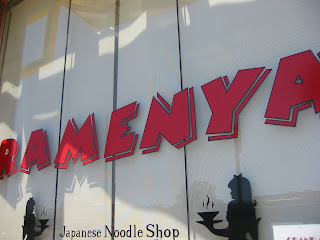 So we headed straight to Ramenya in West LA to get the seasonal (in LA? 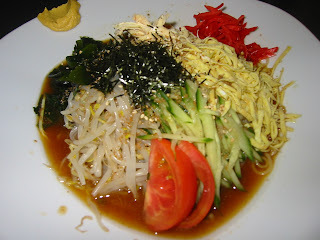 More on this later) Hiyashi Chuka, cold Japanese noodles topped with a motherload of healthy vegetables, seaweed, egg and shredded chicken, sitting in a small pool of sauce that tastes like a combination of soy sauce, rice vinegar and sugar. The toppings include strips of cucumber, bean sprouts and sea kelp; quartered tomatoes; eggs that have been cooked like an omelette and sliced in strips; shredded chicken; pickled ginger strips and toasted seaweed strips for added texture and even more healthiness. Vegetarians could ask to take the chicken out. Vegans wouldn't do because it'd be a slippery slope once the omelette strips were "stripped." The dish comes with a dab of Japanese mustard to be mixed into the sauce, which will subsequently be mixed into the noodles. Depending on how spicy you want it, mix in all or 2/3 of the mustard. Readers of my Shinsengumi post will know that I go somewhere else for my hot bowl of ramen on a cold day. I am not a huge fan of Ramenya's hot ramen, gyoza or rice dishes, although I have some dissenters who have yet to be bitten by the Shinsegumi bug. If I get really desperate for ramen and don't want to drive all the way to Gardena, Santouka at the Mitsuwa Market in Venice is an acceptable option as it is nearby on the west side (will review separately). But when it's hitting 90 degrees (sorry to the Sun Devils in AZ), there is only one place to go for this almost guilt-free indulgence (because of the sheer amount of noodles, I tend to feel a bit overstuffed afterwards, so I have learned to set aside some noodles before mixing). One curious thing is that Ramenya insists on making this coveted dish "seasonal," as if LA had real seasons! The stubborn restaurant refuses to serve the dish before April and after November or so, which keeps groupies like us calling them and asking with full anticipation, "are you serving it yet?" I think most, if not all, of the ingredients could be found during the cold winter days in LA. We sometimes casually ask the wait staff if there may be a remote possibility of making it a year-round item on the menu, to no avail. I guess they're set on serving it as a seasonal dish. It's fairly small and gets pretty crowded during the lunch rush on weekends but it's also a quick turnover. Grab a Japanese fashion magazine -- or your favorite manga -- neatly stored on the bookcases lined up by the counter and check out those designer duds while you wait. Ramenya recently opened a spinoff restaurant nearby serving Korean dishes such as soft tofu soups (soondoobu) and rice mixed with vegetables (bibimbab), but I have not yet tried it. The name of the new place escapes me, although I do recall Ramenya posting ads on the opening all over its restaurant. I'm getting hungry again. Not sure if I should read the blog closer to sleeping time. I had a real kick out of "during the cold winter days in LA"! Is there such thing? In any case, we should check out this place when I visit LA in August. indeed, phas, but the endorsement is for one thing only. are you still traumatized? There's just no good soondoobu in L.A., sorry. You have to go to Pyung Chang Tofu House in Oakland. Hopefully it's still good these days. In its heyday it was the best soondoobu and panchan around.